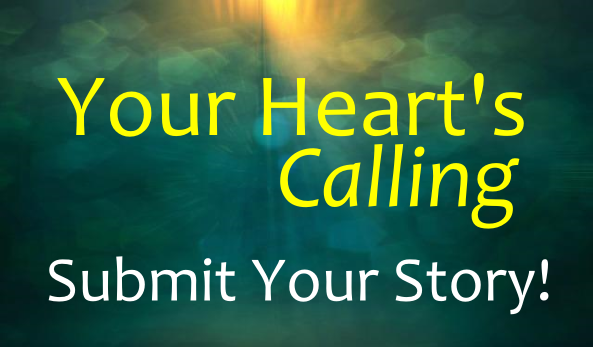 I’m finishing my next book, Your Heart’s Calling, this summer and I’d appreciate your help, as would my future readers. Do you have a story about how you had a dream in your heart, but were afraid to go after it? The obstacles seemed so big! But you followed your heart, moved through the obstacles and fears, and came out the other side – and are so grateful you did! If you’ve had this experience, you can help others who are facing fears to follow their heart. They would love to read your story for inspiration. It’s quick and easy to submit. Just email me your story using the guidelines below. Not more than 2 pages typed. FOR YOUR HELP… If I use your story in my book, I’ll gift you with a 20-30 minute free consultation where we can talk about how your story fits into your bigger life purpose, what your Soul was wanting you to learn and grow from the experience, or any other way your experience contributes to your life lessons. It’s not a hypnosis session, rather talking to help you see your story from different perspectives. Plus, I’ll send you a free autographed copy of the book. Describe your heart’s desire. What is it you wanted to be, do, or create? How strong was your desire? What were your biggest fears? What would you lose (or afraid you would lose) if you pursued your dream? What were you biggest obstacles? What stood between you and your dream? What helped you decide to “go for it anyway!”? What action steps did you take to move toward your dream? Did you receive unexpected help or support? Did more obstacles come up? Did your dream come out as you had planned, or did it change? What is your life like now that you have followed your heart’s calling?